Learning to swim as an adult has been an adventure. Most people learn as a child but because I grew up in a Southeastern Alaska town that did not have a swimming pool at the time. There were Red Cross lessons at the beach in the summer but alas, the temperature of the water was a cold 48 degrees, not conducive to learning to swim. When I learned to swim in college in a PE class; I learned the mechanics of all the strokes but I never felt comfortable in the water. I was always a “panic swimmer”. Swimming in the ocean in Hawaii meant my husband had to always be by my side, the same in lakes in Idaho, Jim was my safety belt. When I was diagnosed with Multiple Sclerosis in 2009 I started to get my only exercise in the pool at Bally’s Fitness. I only swam with my head out of the water or the backstroke, safe and able to breath easily. When I discovered Wendy Neely in 2013 she was a Godsend, teaching me breathing techniques that helped me to stop panicking. I now swim with a great group of people on the Blue Wave Aquatics Masters Swim Team. Though I am the slowest swimmer in the pool, they encourage and help me each day we are in the pool. Though I will probably never compete in a swim meet, I did decide to take on a 30-day challenge. This is a challenge to turn out 30 days in a row and swim. My goal was to swim a minimum of 30 minutes each day or a maximum of one hour. I was able to accomplish this for all 30 days. I now work out at LA Fitness or with the team at the Weyerhaeuser King County Aquatic Center instead of at Bally’s. When there is a swim meet at the Aquatic Center, the team swims at a time and location that is very convenient for me every day of the week. Suddenly, with several meets scheduled at the Aquatic Center, I was swimming nonstop and well on my way to 30 days. Unfortunately, I turned up with a pinched nerve in my back which gave me muscle spasms from my left glute, down my leg to my left ankle. Because I felt no pain in the pool, I kept swimming. The fact that I had so many days under my belt gave me the resolve to go the distance in the 30-day swim. 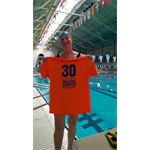 I feel a great sense of accomplishment for completing the 30-day and I hope to encourage anyone who is not comfortable in the water to come to Blue Wave Aquatics and give Wendy a chance to teach them to swim. Learning to swim with coach Wendy Neely has been the best move I have ever made. Wendy loves to teach adults and it certainly shows. She is so extremely knowledgeable with ways to train, pitfalls to training, picking apart your strokes to help you improve and always, always encouraging you every step of the way (and with a great sense of humor I might add). Have you had a great experience in our swim lesson program, Masters Swim Team, or Clinic? Have our Coaches help prepare you for a Triathlon or Race? Click here to submit your tesimonial!